On December 21, the Memorandum of Cooperation was signed between oikos Tbilisi and European University, which aims to strengthen student activity in sustainable development, in various trainings, workshops and seminars, also in participating in international conferences. 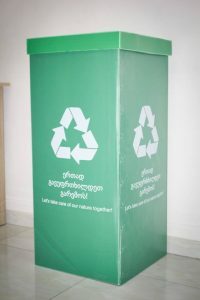 Within the framework of the project, “Green Boxes” will be installed at the buildings of European University. The Green Box aims to promote the collection and recycling culture of waste paper and popularization of paper packets. The project is supported by bookshop “Biblus”. Let’s take care of the environment together.